War Merit Cross 2nd Class with Swords Document to Anton Koller; in the name of the Fuhrer and the High Commander of the Wehrmacht, I Award to Obergefreiten Anton Koller of the 75th Motorised Light Flak Battalion, the War Merit Cross 2nd Class with Swords. From the Command Post on the 29th of April, 1943. The Chief of Luftflotte 1 and Commander in the East, Alfred “Iron” Keller. 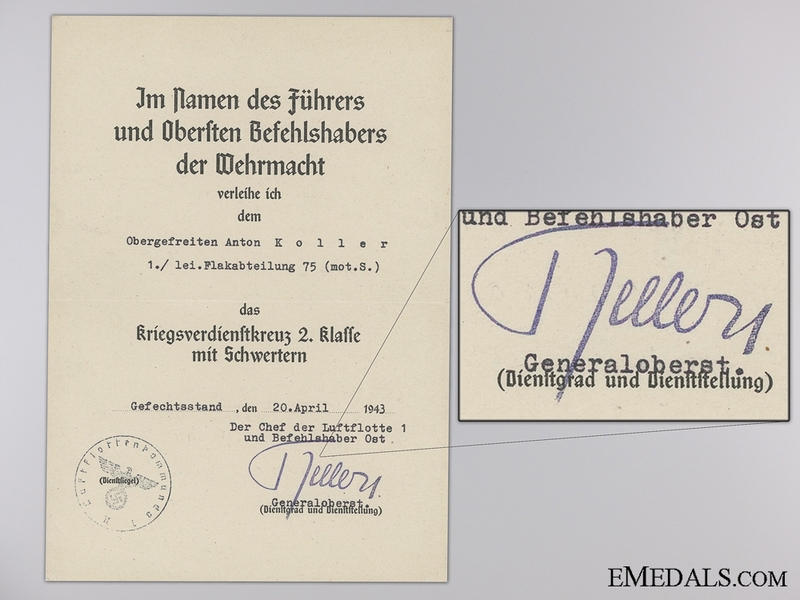 The document is folded in half but is in generally fine condition, with a facsimile signature of Alfred Keller and a “PAPIERFABRIK WEISSENBORN” watermark.